Spring is often the time when we find problems with our hedges, where due to damage or death a gap has developed. This can be because one or more branches were broken in winter, perhaps by storms or careless snow-ploughing. A plant or two may have died for unknown reasons, or perhaps due to trimming issues a section looks bare, and the trunks can be seen. The loss of a section big enough to create an actual break in the hedge is a genuine problem, and one that cries out for a solution. Thinning and poorly-developed areas are usually less serious, but still, they create an eye-sore we would rather not see. In either case, a solution is needed, so let’s consider how to solve this all too widespread problem. Often the first response is just to dig a small hole and put in one or more small plants, expecting them to grow and fill the space. This rarely works. Small plants added in this way will either die in a few months, or sit, hardly growing at all, sometimes for years. The problem persists and just doesn’t go away. The reason is root competition. The established plants in your hedge have vigorous, well-established and deep roots. If you make a hole and loosen the soil, the surrounding plants will respond by immediately sending voracious feeding roots into the loosened soil, filling it quickly, and stealing that extra water and nutrients you are giving the young plants. The babies never have a chance against those vigorous old-timers. The first step in getting your gap filled successfully is to use large plants – the larger the better. Since you only need one or a few, the extra cost of bigger plants is not the same issue it was when you planted the hedge. Indeed, with a new hedge there is a good argument for using slightly smaller, younger plants, as these often establish faster and catch up in a few years with a hedge made of larger plants. For gap filling, this is not true. A new big tree has a much better chance of resisting the bully tactics of the established plants in the hedge. Buy nice big plants. Our goal in filling those gaps is to make them disappear, and instead replace them with regular hedge. To do that they need to be correctly place. Too far back from the face of the hedge and there will be a recess for years to come. To near the face and they will never be able to develop properly. 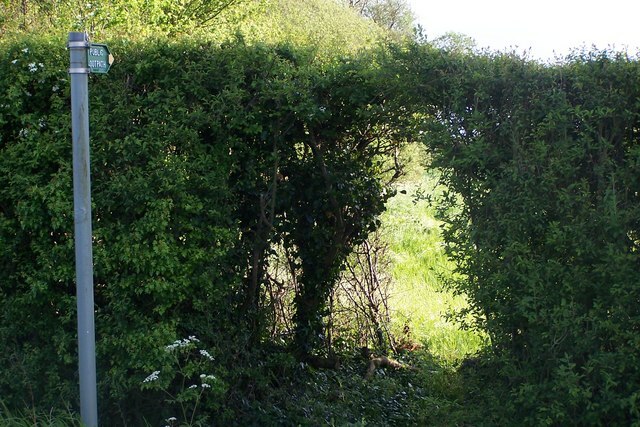 If your hedge is very wide, which old hedges can be, then you may need to use two plants, one on each side closer to that face, or the gap will be there forever. How far back to set the plants depends on the type of hedge you have. With smaller hedges, made from Emerald Green Arborvitae for example, then 18 inches back is about right. For larger plants, like Thuja Green Giant, 2 feet should work well. The important thing is to have enough room for the new plant to develop good branching structure and a wide face, but not so much room that it takes more than 2 or 3 years to fill in. Some people try planting small plants at the face of the hedge, trying to fill in bare sections at the bottom. This never works, because there is no width for the new plants to grow into. Every time the hedge is trimmed, the new plants get scalped right back, and eventually die. Another factor is spacing, if the gap needs more than one plant. If the original spacing is wide – and you can check that by finding the original rooting spots – then you will have a large gap if one plant dies. You will be able to fill that gap quicker if you use two plants where one used to be. However, don’t go closer together than the minimum recommended for the plant species you are using. This is often 3 feet apart. If you pack them closer they will struggle upwards, instead of spreading wide, so you still won’t get that gap filled properly. Once you have decided on the position for the new plant, or group of new plants, you must create a large space for them to grow in. This is vital, but it can also be hard work. The roots of an established hedge are thick and dense, so you need to cut them away with a sharp spade. There is never room for a roto-tiller, so the digging must be done by hand. Tough as it can be, you need to make the biggest space you can for your new plants. Don’t worry about the roots you are removing, there are plenty more where those came from. Anything an inch thick or less is unimportant. Thicker roots should be left in place if possible – just trim the side roots from them. Use sharp pruners to make a clean cut on the severed roots – don’t leave broken, jagged cuts where disease can easily enter the trees. Make the hole as wide as you can in every direction – 2 feet across or even more, if there is room. Go down at least a foot, and break-up the underlying soil. By the time you remove the pieces of dead root you may not have enough soil to refill the hole. Bring some rich soil from another part of the garden and enrich all the soil with organic material and bone meal or superphosphate – for good root development of the new plants. If you are placing your new plants into a small space between large, established plants, then those established plants will quickly send out vigorous roots and compete with the new plants. A good strategy in that situation is to create a barrier on two sides of your planting hole, to keep those roots out. Don’t go all the way round, just on the sides against the existing plants. Double thickness plastic sheeting is suitable, or pieces of board, which will last a few years before rotting away. Take the barrier down at least 12 inches, and deeper is better. Make it at least 2 feet wide, and 3 feet is better if you can. Bring it a couple of inches above the final soil level, so roots don’t grow over the top. Finally, give those new plants extra care. Make sure they are well watered and regularly fertilized, so that they quickly establish and develop. If you handle it well, filling gaps is possible, and is a lot more satisfactory than starting all over with a new hedge. Mind you, if the damage is extensive, and you have several large gaps, starting afresh is probably the best strategy. Its almost impossible to rebuild a hedge damaged extensively. With the strategies we have outlined here, you should be able to successfully fill in damaged spots, so that in a few years you won’t be able to even find them.